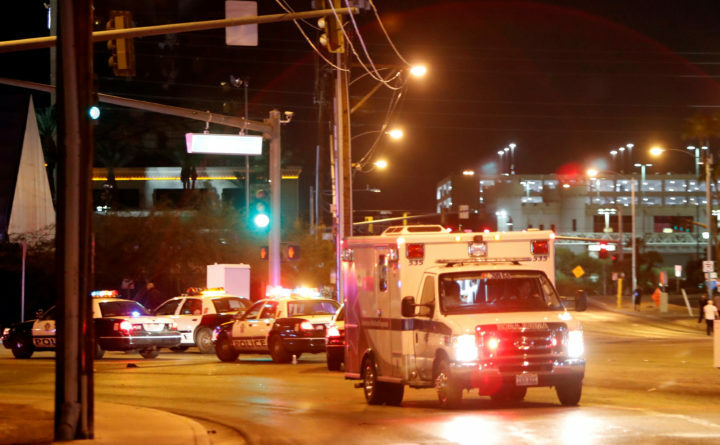 An ambulance leaves the concert venue after a mass shooting at a music festival on the Las Vegas Strip in Las Vegas, Oct. 1, 2017. Seconds after the pop-pop-pops started echoing through the Las Vegas Strip on Sunday night, the music stopped and concertgoers tried to decide what had happened. People started to scream as bullets sprayed into a crowd of thousands of attendees at the three-day Route 91 Harvest festival in Las Vegas. Some people started to scatter and search for cover. But some people stayed behind — or even made their way to the chaotic and deadly scene — to help the victims of the deadliest mass shooting in modern American history. A gunman had opened fire as country music singer Jason Aldean sang onstage. At least 58 people were killed, including an off-duty police officer with the Las Vegas Metropolitan Police Department, authorities said. More than 500 others, including two on-duty officers, were injured. The gunman, identified by police as 64-year-old Stephen Paddock, was found dead in his hotel room on the 32nd floor of the Mandalay Bay Resort and Casino by Las Vegas SWAT officers. Blyleven said he and his brother-in-law guided their group out of the venue, ducking behind barbecue vendor carts, as gunshots continued to strike around them. Once he had gotten his group out, Blyleven headed back into the concert venue, joining a group of volunteers who hoped to get more people out. “The shooting just seemed like it went on for 10 or 15 minutes,” Blyleven said. He said he saw a police officer who had been shot through the neck, and carried out the lifeless body of a young woman who had been hit. Blyleven, who is the son of Hall of Fame pitcher Bert Blyleven, said he has no formal medical training but that he felt obligated to do whatever he could to save lives. During the gunfire, Mike McGarry, a 53-year-old financial adviser from Philadelphia, said he tried to shield his children. “It was crazy — I laid on top of the kids. They’re 20. I’m 53. I lived a good life,” McGarry told Reuters. He said he had shoe prints on the back of his shirt from people who ran over him to get away. A parade of police officers, firefighters and paramedics rushed to the scene of the shooting, where good Samaritans were seen in photos kneeling down, tending to victims. One man told Fox News that he hid behind a table and, when it was all over, helped load several bodies into a truck. In the background, people appeared to be carrying victims on pieces of fencing to get them to safety. In the hours after the shooting, a nearby blood donation center became full, and people who lived nearby were trying to find ways to help those still at the scene. Jessica Perez, who was at home in bed when she heard about what had happened, told the Las Vegas Review-Journal that she loaded water into her car and she and her brother and her cousin headed for the scene of the shooting. “My heart hurts, and I can’t believe this is happening in my home,” Perez added.